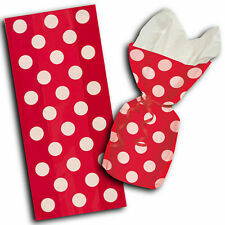 ---This is a pack of 20 Polka Dot Spot Red Birthday Cellophane Loot Treat Gift Party Bags with Twist Ties. ---Each of these fantastic cellophane bags features a stylish design filled with white spots on a red background. ---Every bag comes complete with a matching twist tie. ---(Crepe paper NOT Included) ---Perfect for any occasion these stylish party bags are fantastic for Birthday parties and great for handing out sweets and treats to your party guests. ---This is a pack of 20 Polka Dot Spot Black Birthday Cellophane Loot Treat Gift Party Bags with Twist Ties. ---Each of these fantastic cellophane bags features a stylish design filled with white spots on a black background. ---Every bag comes complete with a matching twist tie. ---(Crepe paper NOT Included) ---Perfect for any occasion these stylish party bags are fantastic for Birthday parties and great for handing out sweets and treats to your party guests. Pumpkin shaped loot bags, perfect for collecting all those treats. 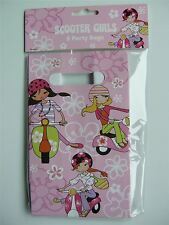 5 x Scooter girls paper party bags. Unopened, the bags measure 200mm tall and 120mm wide. 20x Sunflower Yellow Spotty Cellophane Gift Bags. Party Bags. Party Bag Fillers : Upto 99p. Party Bag Fillers : �1.00 - �1.99. Party Bag Fillers : �2.00 - �2.99. 5 PARTY BAGS -TINY FEET. Colours are white, pink and blue and are suitable for either little girl or little boy events. Pack Of 20-11 Inch Height X 5 Inch Width Approx..
Great Item For Your Party-Excellent Party Product. Measures 4 x 9 1/2 inches Includes 25 clear bags and 25 ties . The box is the perfect size for use as a traditional party bag to be filled with small gifts and treats. They are printed using non-toxic, dye based ink on high quality, professional grade, matt 240gsm white card. These boxes are the standard and most popular size. This item carries the CE marking certificate. Perfect for any children's party! Great for Displaying Yummy Cookies/Biscuits, Baked Treats, Cupcakes & Cakes. These fun party bags are a great addition to any children's or adult's party. Just the thing for Christmas! Great for Christmas fairs, bake sales and charity events. Baby feet party bag Fill with candy, cookies and other goodies Great for baby showers Waiting for the pitter-patter of little feet was never more colourful or fun Size 4-inch by 9.5-inch . This is a job lot of 150 "fairy princess" loot bags. Each one is approx 22 x 16 cm with print on two sides. "FAIRY PRINCESS" DESIGN LOOT BAGS. Each clear cellophane bag is printed with a yellow & clear polka dot design. Give your party that finishing touch! These fun party bags are a great addition to any children's or adult's party. Just the thing for Christmas! Great for Christmas fairs, bake sales and charity events. Make your own party bags for guests by filling them with treats, sweets and toys?. 10 Girl printed the same on reverse cellophane bags 14 x 20cm. These are not self adhesive bags. 12 Halloween self adhesive cellophane bags 10 x 11cm. Approx size: 11" x 5". This product is supplied by Unique Party.